Now available at the APR YouTube Channel is the opening of the third series of "Explanatory Videos" produced by Tokyo Electric Power Company which cover the recovery from the Fukushima Daiichi accident. This video covers many of the basics of radiation - how it's produced, what some basic terms and measurements are, and some thumb rules. The video is actually very interesting (even if not all the captions and illustrations have been redone in English) and it would be good viewing for anyone who has basic questions on radiation or radioactivity. Click here to get to the APR YouTube Channel. NHK has carried the distilled result of information it has obtained from TEPCO regarding the possible amount of fuel damage, and melt, and vessel failure, and fuel melt into the dry well at Fukushima Daiichi No. 1. To summarize the report (and we should note this is all preliminary) TEPCO feels that the melted core material that exited the pressure vessel may in the worst case, or in other words if the worst postulated case exists, have eaten about 2/3 of the way into the bottom structure of the dry well. No exit of the material from the dry well structure is supposed. TEPCO does not feel the material could have gotten below the structure, or into the actual basement, or come in contact with the floor or the ground. The material is not in the earth below the plant. Such reports as this are circulating, leading to a widely hysterical supposition on one site of a "hydrovolcanic explosion." That is about the worst - and certainly the least intelligent - hyperbole this author has ever read. I only mention it here because TEPCO's initial analysis released to NHK today (and about which I'm sure we'll see more) is timely in relation to that story. Readers of this blog are all too well aware of this likelihood. In fact, let's take a look at a post from way back -- below is a link to a post I made on May 14th, 2011 when details were still far from clear about the plant conditions. Readers may recall, a couple of months back, repeated attempts by TEPCO to indirectly assess the conditions of the lower vessel heads at the three reactor plants. None of these was successful - no useful data was obtained. What was clear though was that the electrical equipment in the lower head area was very heavily deranged, and not just in one zone or area, it appeared. TEPCO would like very much to get a handle on the actual condition and location of core material at each plant (and each is different in this respect) but so far has been really unable to directly assess this. The new study results that NHK is quoting come from a variety of data TEPCO has accumulated which don't require direct vision or detection. This is probably the best we'll have for a while. When TEPCO releases the full detail of this report, I'll put those details here. The NHK report indicates a melt depth of about 2.1 feet. The distance to the ground is roughly eighteen times this depth from the dry well interior floor to grade. 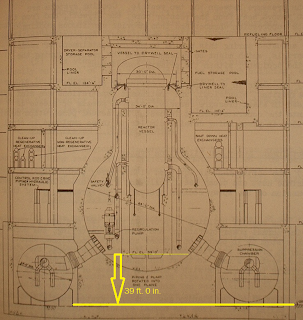 Below is a drawing from WASH-1082 which I've marked to show the distance from the dry well floor to the grade outside, which on the particular plant shown is 39' 0". I do not presently know the exact measurement at Fukushima Daiichi No. 1 but it is likely within ten percent of this measurement... meaning that in the worst case that TEPCO is describing, by its own data, the core material may have melted only about as much as 5% of the distance to the grade. Labels: "fukushima daiichi", "melt", "meltdown", "NISA", "TEPCO"
I have made several posts on Twitter and on the FB page for APRA as developments on the nitrogen purge have become, but it's time for a roundup here. Since the discovery that hydrogen gas was trapped in the upper part of the reactor vessel at Fukushima Daiichi No. 2, TEPCO decided that even though the concentration was not high enough to be dangerous (2.9% was found, while hydrogen concentration must be above 4% depending on humidity to be combustible) it was high enough to consider and then implement a nitrogen purge directly to the reactor pressure vessels themselves. In order to make sure all of our readers (and we get new ones all the time) are clear on what is going on, let's look at some illustrations we've used before on this site but which have some new captions. Below is a view of what the reactor plants at Fukushima Daiichi look like. 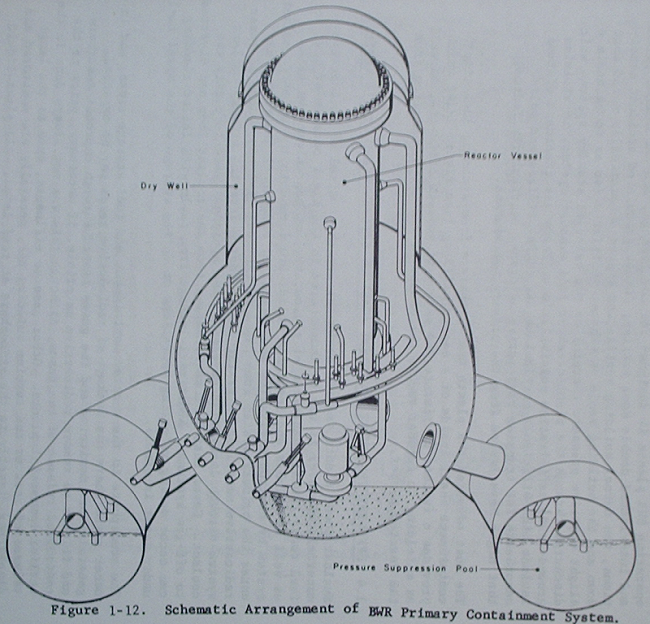 By that I mean BWR/3 and BWR/4 reactors, installed in Mk I containments. 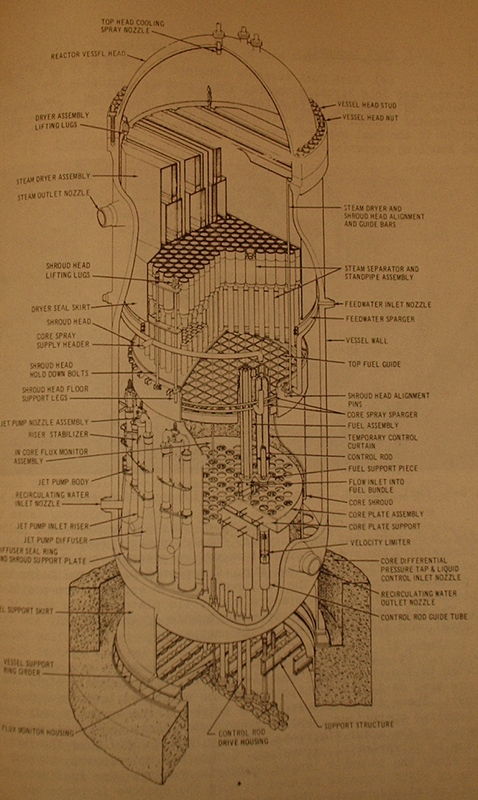 Below is a view of the drywell assembly, inside of which is the reactor vessel. The drywell is the primary containment. We know that the reactor cores have been seriously damaged; in fact, they are in all likelihood nearly completely damaged or destroyed by melting due to overheating. This can be expected to cause the fuel elements to collapse. That is the reason that I have used, and continue to prefer, the term "demolished" for the cores in these plants. So first we know that the cores are not in their expected locations, but are in all likelihood fallen to the bottoms of the pressure vessels. However, we also know (and knew very early on) that the cooling water being injected to the reactors was getting into the reactor buildings. 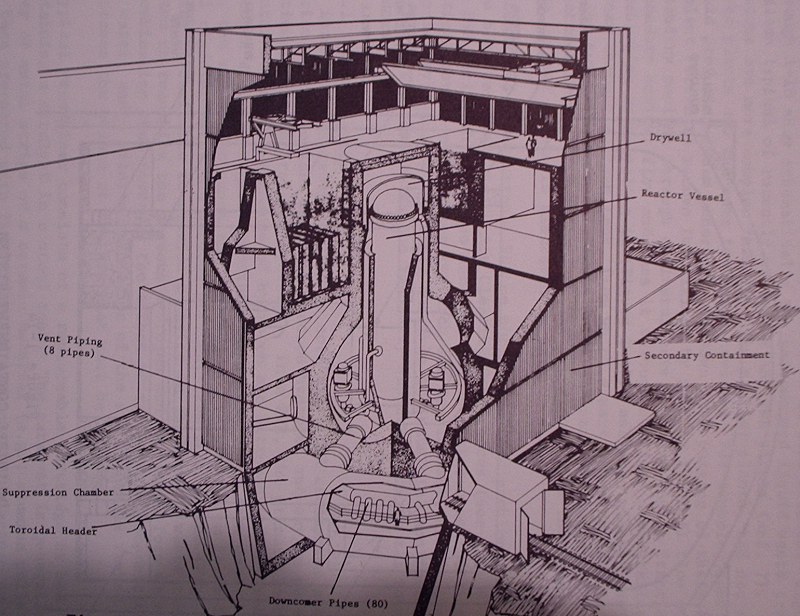 The best guess of course as to how it was getting out of the reactor vessels is that the core melt caused damage to the lower ends of the vessels. It seems unlikely that the entire cores have fallen out of the vessels, into the dry well area, according to TEPCO and NISA. But damage to the many various openings at the lower vessel head area is probable in part, and there may even be direct melt openings in the vessel lower heads. The hydrogen gas we are talking about in these plants came from two sources during the accident: Hydrogen liberated by the energetic zirconium-water reaction which is expected in a serious core melt accident, and also by more normal radiolytic decomposition. Presently the generation of hydrogen, which is very slight, is only by the latter process. However, because there has been no gas flow in the upper ends of the reactor vessels, some hydrogen has probably been trapped there a long time and any new hydrogen may congregate there. To mitigate this, TEPCO has now added nitrogen feed to the reactor vessels instead of to only the primary containments (dry wells.) TEPCO has jumpered in, if you will, the nitrogen feed to the top core spray line (normally used for cooling water) to push the hydrogen through the vessels and into the drywells. Knowing that hydrogen will be flushed, TEPCO has almost doubled the nitrogen feed rate to the drywells from the previous rate. Below, you can see the top spray line I'm talking about at the very top of the illustration. Click all illustrations on this page to enlarge them. Below is an illustration I've made for this post. It is very large, but must be blown up to see the detail. These are the details at the moment. Updates will appear on the APRA FB page, and/or on Twitter (see the Twitter news feed at the right of this page) until another post here is required. Labels: "fukushima daiichi", "hydrogen", "nitrogen", "TEPCO"
TEPCO has reported some spikes in gas temperature readings and air conditioner (primary containment) temperature readings at Fukushima Daiichi No. 2 plant. These readings show some sharp increases, or in the case of the A/C plant a "stair step" increase. Some alarm may be generated in the public (and the press) if these are not properly interpreted. 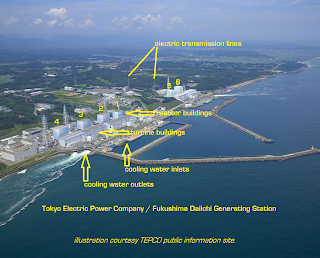 -TEPCO has begun lowering the feed rates at all three plants in order to INCREASE the temperature of the reactor cores and thus the volume of cooling water in contact with them. This is being done to increase the amount of steam extant inside the pressure vessels to ensure that hydrogen trapped there cannot burn. -The desire to lower the chance of hydrogen burn follows the discovery that hydrogen gas was indeed trapped inside the reactor vessel of No. 2 plant, with a maximum reading of 2.9%. TEPCO is altering its nitrogen feed plan at all three plants to give direct nitrogen purge to the pressure vessels, not just the primary containments. This new nitrogen feed is to be at twice the present rate. -Given the lowering of feed rate to increase temperature and thus steam it follows that damaged cables / wires may be further damaged by the increase in moisture. 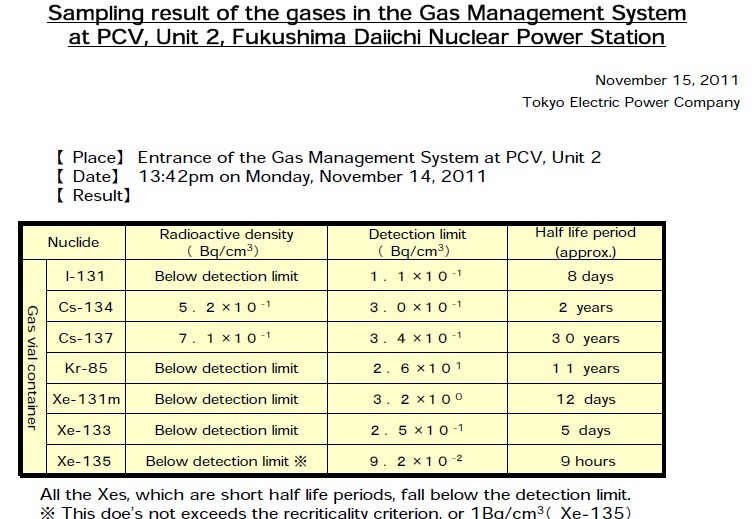 Given this fact, TEPCO is investigating to determine the failure mode of the equipment that is giving errant readings. To be clear, there are other detectors that are NOT showing the same temperature increases, but rather are showing the expected gradual increase. This set of facts is very likely to be misinterpreted by the press and deliberately misinterpreted by the anti-nuclear crowd. That's why I'm posting this explanation about the temperature increases, which are deliberate, and the reasons for this. Keep in mind that the APR Twitter feed noted the beginning of this operation as soon as it was announced; watch the Twitter feed for further updates. The rotating Carnival of Nuclear Bloggers is up (very early this Sunday morning) over at Brian Wang's site "Next Big Future." This rotating feature travels around the nuclear blog sites and features the very best of the nuclear blogging world. I highly suggest that anyone interested in nuclear power check it out every time it appears (which is weekly) to get a wide scope of opinions on a wider scope of topics. Click here for CARNIVAL 80. As a final note, Atomic Power Review does in fact have a contribution this week; the article on PRA and transmittal of risk data to the public. All of us with any interest in nuclear energy have spent the better part of this year locked in a struggle with the realities of the Fukushima Daiichi nuclear accident. While many of us had known about the (remote) chances of such an occurrence prior to the March, 2011 earthquake and resulting tsunami that triggered the accident, it's likely that few placed a high enough chance of actual occurrence on such an event to cause worry. What is most unfortunate is that now, having had to watch, analyze, write about and sometimes defend actions by TEPCO, NISA and the Japanese government on and off site, the chances of any other such event are still as low as they were before the event .. and that no one will realize this fact. We might actually blame the US Government for this, in reality. This line of thought was recently brought up in this writer's mind when the NRC published a brief historical perspective of the PRA or Probabilistic Risk Analysis technique that was used in WASH-1400, known as "The Reactor Safety Study." You can see this piece at the NRC blog by clicking here. It has long been my concern that such a document pushes away the general public because of its complexity. For background and support, I'll give a brief additional history to that found in the NRC piece. 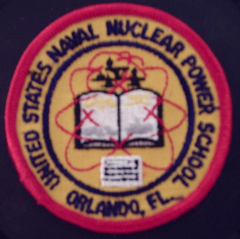 Even in the earliest days of nuclear energy in this country (both military and commercial) it was recognized that any accident that caused harm to the general public or damage to citizens' property must be avoided at all cost and plants were designed with so much conservatism overall at the beginning that today we might be surprised. 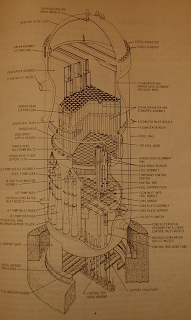 As the best example, the first commercial nuclear power plant, the Shippingport Atomic Power Station, was constructed with all of its primary components below grade in massive reinforced cylindrical or spherical (for the reactor) vessels. I could go on for days about early plant design, but that isn't the focus. What's important is that even with the conservative designs, many still wanted some sort of study performed that could augur the real risks to the public from nuclear power plants were there to be an accident. This desire resulted in the first watershed safety study to be performed; this was an Atomic Energy Commission study titled "Theoretical Possibilities and Consequences of Major Accidents in Large Nuclear Power Plants." This study was completed in March, 1957 and received the AEC publication number WASH-740. This study has often been named as the first such of its kind, and often been cited as having been far too unrealistic in its assumption of what would actually occur if an accident took place. For example, WASH-740 indicated that if a 500 MWt reactor plant were to melt down and the containment were to fail, this might result in 3400 dead and 43000 injured. We can see clearly from the multiple reactor accident in Japan recently, the Chernobyl accident in Russia and can surmise from other accidents (this many years later, I must note) that this study was way over the top in its estimations. Because of the increase in plant size over the years, there was pressure to re-perform the analysis taking into account the larger source terms that more powerful reactors would generate and, as a result, the study was revised in 1967. This analysis did not appear in public, and was kept within the AEC. However, there was a clear need for a document for the public which would be more readable, more reassuring, more descriptive and more thorough than WASH-740 and another effort was begun. This effort resulted in a document frequently quoted ONLY on Atomic Power Review and little remembered today for it was never widely published and only appeared in draft forms. 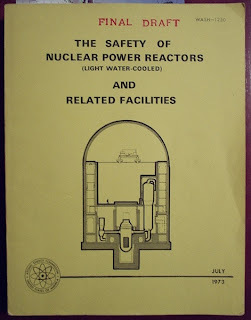 This document is something that I consider to be vastly superior in content to either WASH-740 or the later and more famous WASH-1400 made to stand on WASH-740's shoulders because it's written for the general person and contains a great deal of basic information about nuclear energy in general. 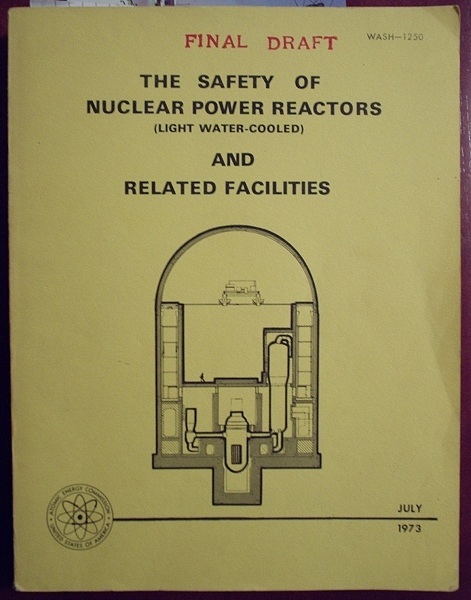 This document was titled "The Safety of Nuclear Power Reactors (Light Water-Cooled) and Related Facilities." The publication number was WASH-1250, and I have one of few copies here. There has been but little information made available concerning the fate of this document. However, the transcript of a speech given by Joseph M. Hendrie in 1986 (see DOE database, document BNL-36253) and which was titled "A Probabilistic Commentary: The Rise, Fall, and Rise Again, of Risk Assessment" and in part on which the recent NRC blog post may be based does mention this obscure WASH-1250 document. Unfortunately (according to Hendrie's speech) Senator Pastore, a ranking member of the JCAE did not feel that WASH-1250 was what was needed to get at actual risk to the public. Although 1250 was ready in preliminary draft form in 1972 the JCAE commissioned essentially a full revision of the WASH-740 study with new PRA techniques using fault tree analysis, as a totally separate effort, and the final draft (shown above) of WASH-1250 which was prepared in July 1973 never really saw the light of day. This is where the problem with public assessment of nuclear power risk and benefit begins. The decision to make the sole effort essentially a "new math" exercise made almost sure that the information would be daunting to the average man on the street. 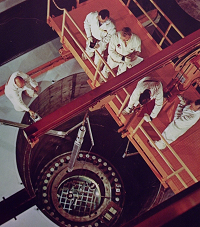 In point of fact, the formal debut of WASH-1400 in 1975 was accompanied by the launch of a training course for NRC personnel titled "System Safety and Reliability Analysis" to help with understanding the analytical method; this ripened into the development and publication of NUREG-0492, the "Fault Tree Handbook," to make a text for such a course generally available. Joe Average doesn't want to have to take an advanced math course to be able to understand what his relative risk from nuclear power is. Even then, he won't want to take the time to find out why this or that fault tree branches off at "relief valve fails to reseat / no operator action" and then assess a percentage risk in terms of reactor-years for core melt. WASH-1250 was in my opinion the right way to go for persons outside the industry, while WASH-1400 was the right way to go for persons inside of it. I am left to wonder whether the voluminously informative 1250 was lost in the dust of the splitting up of the AEC; surely, the new, almost anti-nuclear NRC would not attempt to publish a document like 1250 because of its almost clear but always implied support for the capability of the industry, the owner-operators, the regulator and anyone else involved. WASH-1250 in fact admits a slight pro-nuclear bias, right on page ii of the prologue... "By and large, however, it is a summary and discussion of a large body of published information pertinent to nuclear safety, as interpreted by AEC staff. The reader will, therefore, understand that a certain degree of pro-nuclear power bias is probably inherent in the discussion, although staff has tried to make the presentation as simple, factual, and objective as possible." 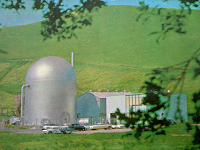 The simple fact is that after the publication of the final draft of WASH-1250 there has been exactly one nuclear accident at any US commercial plant (which is only what this volume is intended to discuss -- nuclear plants built to US practice, inside the United States) at which no one was killed or even injured. Thus, at least in terms of integrity of this report, there is no damage in so far as no major accident has occurred at any US plant to contradict it. 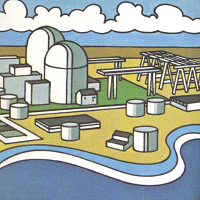 While the previous may seem defensive to those either undecided or anti-nuclear, it is simply meant to indicate that such a report -- which does not augur disasters and then calculate their average chance of occurrence and resulting damage, but rather which attempts to clearly explain safety in design, construction and operation -- is not inherently pro-nuclear but actually inherently, simply explanatory. "... It is a fair presumption that knowledge and techniques will be improved in proportion to the future effort devoted to such studies. In this connection, the AEC has recently undertaken a quantitative, probabilistic study to try to reach some meaningful conclusions about the risks of accidents from nuclear power plants currently in service." "It is possible to conclude from the order of ranking currently perceived that nuclear power presents one of the smallest man-made risks (mortality) to which mankind is exposed." One could get that assumption from any number of places, but when one reads only PRA for nuclear accidents, one gets locked into the thinking that surely one of these or another, or something not exactly predicted but nevertheless dangerous (as TMI was, exactly) is bound to happen. It might, but the death toll from nuclear accidents since WASH-1250 in the United States is still zero, so that even if something predicted by PRA does happen, or something almost predicted does happen, the risk is still incredibly small to plant operators or the public when compared with almost any other risk. What I am really talking about here, of course, is slant. Publication of loads of PRA work to indicate risk of every conceivable failure and operator fault is actually necessary but indicative only of the negative side of things, as it were, to the average man. Such a volume as WASH-1250 was, which includes a vast amount of detail on plant construction, fuel processing, spent fuel handling, dose rates and effects, regulatory responsibility (and also many complete federal codes) might seem overly on the positive side in terms of simply stating what the industry and AEC were doing to ensure safety, should be considered necessary too since nuclear energy is a major portion of our energy generating capacity in this country. I again wonder if this report were just a bit too pro-nuclear for the new anti-nuclear NRC to allow, and regret that fact if it is true. Labels: "accident", "PRA", "reactor safety", "risk", "WASH"
TEPCO has detected a higher than previously recorded level of hydrogen gas at its Fukushima Daiichi No. 2 plant. 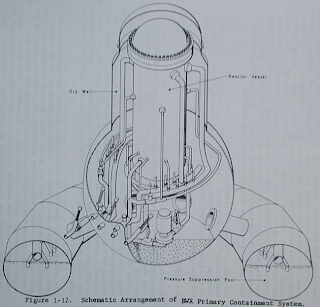 This hydrogen, according to TEPCO, was probably located high in the reactor pressure vessel and primary containment until this time, and was flushed out when TEPCO placed its (improvised) gas handling system into operation. This new gas system changed the flowpaths for gas and is able to purge more of the previously mentioned volumes. The highest hydrogen concentration noted thus far was 2.9%. The concentration has dropped. Roughly 4% is combustible, vapor concentration notwithstanding. TEPCO has made a few alterations to its plans in order to mitigate the possible effect of this hydrogen; it plans to alter the nitrogen purge system feed flow path to inject nitrogen directly into the pressure vessel, instead of into the primary containment. This will take some time. In order to mitigate possible deleterious effects from hydrogen until such time as the new nitrogen feed is available, TEPCO plans to alter the feed injection rate to the No. 2 plant (this means cooling water) to make certain that there is enough steam present to make whatever hydrogen is available not flammable. Upon restart of nitrogen injection to the RPV, the nitrogen flowrate will be doubled. This procedure should flush the hydrogen and prevent any risk of burn. Having been on vacation, I omitted to post the link to the 79th Carnival of Nuclear Bloggers. As I've said before, if you want to get your finger on the pulse of what the nuclear blogosphere is writing about, looking at one of the Carnival events is the first priority. TEPCO has released the fourth, and final, video in its series covering the handling of contaminated water at Fukushima Daiichi. 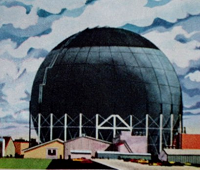 This series has been of particular interest to this writer; after the gravity of the entire accident scenario had become clear (or clear enough) one of the first real races against time was that involved with finding enough storage capacity for the water that was being used to cool the three damaged reactors, since it clearly was leaking out of the reactors and not only entering the reactor buildings but the turbine buildings and even outside pipeways ("trenches" in TEPCO's parlance.) From that point on, a number of simultaneous plans were launched to secure storage and to process this water and for quite some time it seemed as if the company were only a step or less ahead of the water buildup. Quite the opposite is now the case, and in fact, even with the early growing pains that the water cleanup systems had, TEPCO appears to have mastered the situation. I have hammered this following point to death, but it bears repeating: While many accident scenarios have been played out and simulated in the past, even to the point of core damage and melt, none has done anything to educate the industry on the realities of a major accident like Fukushima Daiichi has. TEPCO and NISA are literally writing accident handling procedure as they're inventing it, and are implementing it immediately with only brief, but clear, analysis .. because time is of the essence. It is certain that much hindsight has been used by outside critics in regards to TEPCO's handling of both the accident and its releases to the press in the writing of critical pieces, but this again is hindsight after all and it's hard to imagine a better onsite and offsite performance by any other company. All that considered, please watch this video more than once. It goes by quickly enough that the real complexity of the onsite water transfer and storage job might come off too lightly; consider the size of this site, and look at the overhead plan showing just how much area the tank system is taking up and how widespread it is. This would be a very important thing to consider, at least briefly, for any nuclear plant site --- in other words, if this kind of thing ever did happen on site, would there be enough space for tankage of a magnitude in correct proportion to the number of plants at that given site? If there are enough acres, are they level? Much in this video makes one stop and think on the second viewing. 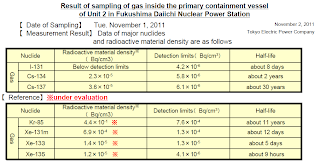 TEPCO has released its latest analysis of gases sampled from the primary containment of the Unit 2 plant... and Xenon (all isotopes tested for) is not present. 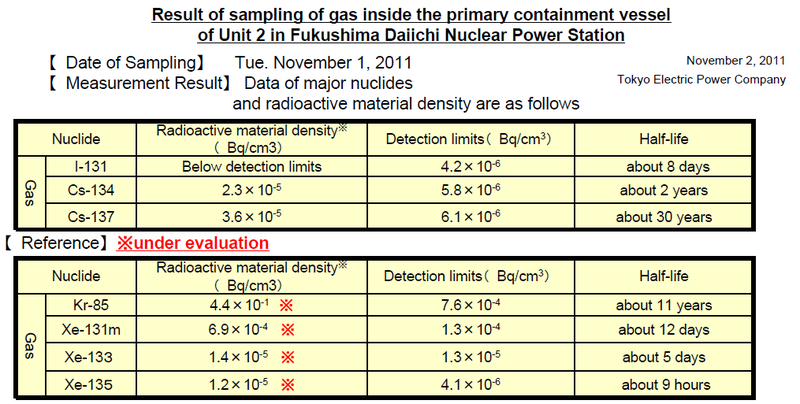 Below is the TEPCO table showing this very latest data. There have been no statements so far of which this author is aware to indicate that TEPCO will not sample Unit 1 and Unit 3 containments for xenon, but this developing trend makes any such action appear not only clearly less emergent but probably less important all the time. Labels: "fukushima daiichi", "TEPCO", "xenon"
After some hiccups in the schedule, the Carnival of Nuclear Bloggers is back in action over at NEXT BIG FUTURE. Episode 78 is on line right now. Seventh in the series of TEPCO explanatory videos, the newest installment covers desalination of plant water at the Fukushima Daiichi site. Available now at the APR YouTube Channel; the new video is presently the featured video. After the flurry of activity earlier this week surrounding the discovery of xenon at No. 2 reactor plant, Fukushima Daiichi site, and the resulting findings and solution to that situation, TEPCO returns to more normal business by releasing its second video of the second set of explanatory videos. In this installment TEPCO explains the cesium adsorption equipment, and some other on-site equipment that is handling decontamination of water from the reactor plants. Some storage issues are also discussed- particularly interesting is the long term storage for used adsorption tanks and for high activity sludge. See below for the new video, up now at the APR YouTube channel. As always, a link is available to the main page of the APR YouTube channel at the right of this page in the information bar. Labels: "areva", "contaminated", "fukushima daiichi", "kurion", "sarry"
NISA and TEPCO have released fairly voluminous documents to support the theory that spontaneous fissions of isotopes such as Curium 242 and Curium 244 may have led to the Xenon detection at Fukushima Daiichi No. 2. While TEPCO's diagram does indicate that neutrons released from these spontaneous fissions can and do trigger occasional fissions in the U-235 fuel material, TEPCO and NISA also indicate (as did I from the beginning) that criticality --- a sustained fission chain reaction in Uranium fuel ---is not actually possible with the core in its present condition. Here is some of the material released today covering the development of the xenon in the PCV and its concentration. We don’t take into consideration the nuclear fission caused by the U-235 absorption of neutron. This is an evaluation conservative enough to show that the Xe135 detected this time was produced in a non-critical state. As the present gaseous phase volume of the reactor vessel is 3,000 m3 (Appendix 2), and the amount of injected N2 is 4m3/h, it takes 214 hours to fully ventilate. the injected N2 from September to October is 14 m3/h, varying little, we think the amount of Xe135 in Nuclear Reactor is well balanced as the following formula illustrates:. Xe135 Radioactive density was measured from the charcoal filter, which was installed in the gas management system, is 1.7E-5 Bq/cc. Collection efficiency of the charcoal filter is 1566 times as determined from the ratio of the value measured in the charcoal (5.3E-1 Bq/cc) and the value measured in a vial. Therefore, Xe135 detected this time, arose from spontaneous fission of Cm. This should put to rest all of the furor that's occurred on anti-nuclear propaganda sites, pages and forums everywhere concerning supposed recriticality / restart of the core, or a continuing meltdown. Labels: "criticality", "fukushima daiichi", "NISA", "TEPCO", "xenon"
the reactor were not significantly changed. TEPCO representatives are making, apparently, the same statements to all media outlets but are seemingly at this point not making any differentiation between spontaneous fissions of U-235 and the two Curium isotopes mentioned this morning. Also at Unit 2... TEPCO has noted a slight increase in hydrogen concentration in the PCV at this plant. A reading of 2.7% on October 30 compares now with a reading of 2.9% on November 3rd. Because of this, TEPCO has increased the volumetric flow rate of nitrogen injection from 21 m³/hr to 26 m³/hr. More details when available... but for now the situation is completely stable and (as I've said before) no fission chain reaction is occurring at No. 2 plant - and neither is a continued meltdown. Labels: "criticality", "fukushima daiichi", "hydrogen", "NISA", "TEPCO", "xenon"
This press release (above) is the 10:00 AM November 3 press release. HOWEVER, some Japanese media are carrying a TEPCO RETRACTION of some previous information, saying instead that the xenon detected in the primary containment has been formed from spontaneous fissions of curium-242 and curium-244. Other statements have clarified any possible criticality - TEPCO stating clearly now that criticality was NOT achieved. (This author has said this many times in the last two days.) The xenon must be the result of spontaneous fission, TEPCO indicates. There will be much clearer information available later today in all likelihood. Labels: "criticality", "fukushima daiichi", "TEPCO", "xenon"
A second sample run at Fukushima Daiichi No. 2, a day after the first, has detected Xenon-135 but failed to detect any Xenon-133. Below is a very fresh chart from TEPCO. This is good news in one way, in that one of the isotopes was not detected. Some Japanese outlets are still reporting that TEPCO wants NISA to assist in a re-evaluation of the samples since it believes (or believed at some point) that perhaps some error in reading may have indicated Xenon in place of another element entirely. TEPCO's latest, very new, press release (3 PM Tokyo, November 2) gives no data at all either about the Xenon detection or the boric acid injection. It also omits the injection rate change and gives the old one. Clearly this press report is in error (probably a clerical error omitting the new entries for No. 2) and I'd expect this to be amended or replaced. 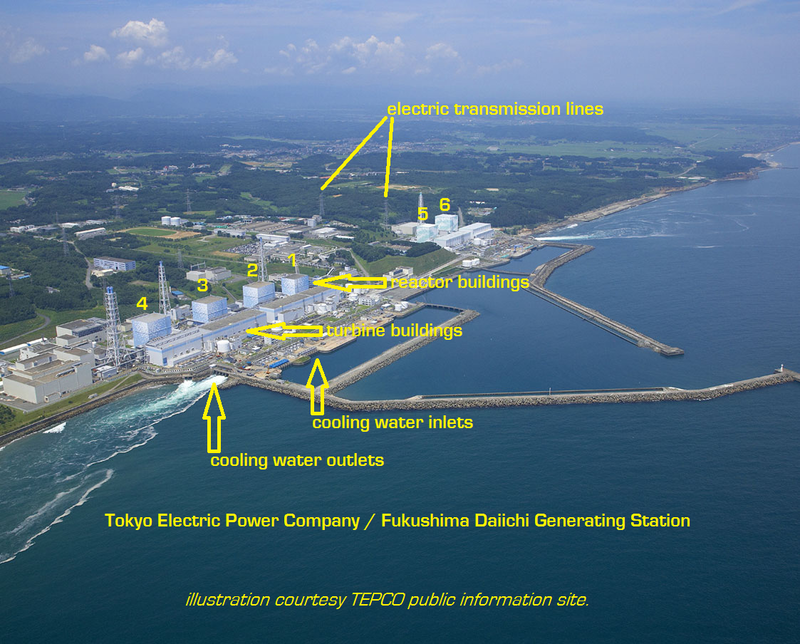 TEPCO will be checking the other two plants (No. 1, No. 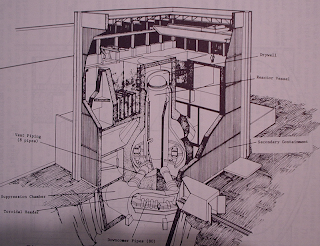 3) with reactor cores installed for presence of Xenon. While some outlets continue to use the term "critical" in reference to No. 2 plant and the fission event leading to the Xenon production, it is imperative to understand that no sustained nuclear chain reaction occurred. No site radiation monitoring equipment detected anything alarming or even spurious. No increase in temperature or pressure was noted. The condition of the remains of the core are just not likely at all to be able to sustain any kind of chain reaction / fission rate... considering the mixture of non-fertile and also poisonous (neutron-absorbing) materials now melted integrally in and around the fuel material. Also... for our non-nuclear friends... the Xenon generated in fission is normally contained inside the fuel elements (be they rods, plates, or other) and decays or absorbs neutrons to move down the chain to a stable element. It remains there permanently. Only because the core materials are damaged or melted at Fukushima Daiichi No. 2 is the Xenon which is produced able to get out into the water and air volume inside the plant at this time and thus be detected by the gas sampling equipment. The effects of Xenon on reactor operation are well known but normally the Xenon is NOT emitted. At this time there are no changes in detected radioactive materials on site or off site, no alerts off site have been made, and conditions operationally on site are as they were before this recent event. -At this point NHK news is leading its broadcasts with the observation that the Fukushima Daiichi station is on what it calls "high alert" and a sensible analysis of the situation. 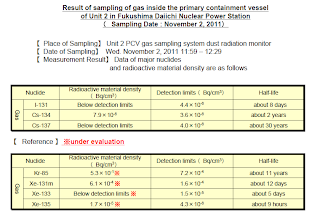 -TEPCO has released some preliminary data on the concentrations as presently understood. The preliminary data is below. -At 4:14 AM November 2... after the boric acid injection... TEPCO increased water injection rate to No. 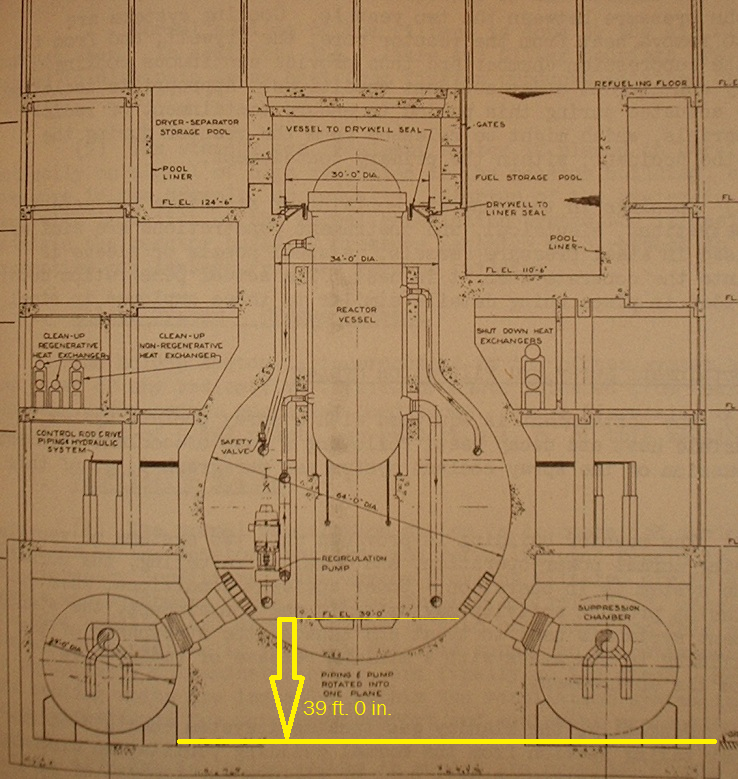 2 reactor slightly, raising the feed line injection rate from 2.4 m³/hr to 3 m³/hr and increasing the core spray line injection rate from about 6.9 m³/hr to about 7.0 m³/hr. These are the most up to date figures. -TEPCO's statements indicate (as I said in the previous post) that there are no expected increases in releases to the atmosphere as a result of this ongoing evolution as it stands now. UPDATE -- 7:40 AM Wednesday. TEPCO tells Japan Times that the Xenon concentration is roughly "one hundred thousandth becquerel per cubic centimeter" for both isotopes in the gas sample. 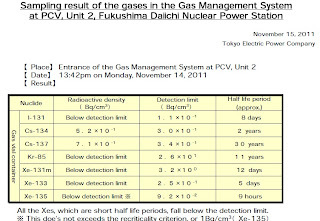 NHK is carrying a description from TEPCO that the concentration of Xenon in parts per million in the gas sample is about 12 to 14 ppm... although the description given in the NHK story is clearly garbled, likely due to lack of understanding. All news sources in Japan are carrying statements obtained from TEPCO contacts that fission is assured to have occurred to generate this Xenon. However, many of them are talking about criticality - which is of course a self-sustaining fission chain reaction. This is not likely; a number of other mechanisms could account for a brief fissioning event in the demolished core material. Further, the deranged state of the core, almost surely with the melted control rod blades integral, makes any sustained chain reaction almost a practical impossibility. The chances of this type of event are higher with a rapid core reflood, but we've already shown the injection rates and no rapid increase in injection has occurred. More details as they're available. Labels: "criticality", "fukushima daiichi", "NISA", "TEPCO"
-TEPCO has injected borated water (boric acid suspension) into No. 2 reactor at Fukushima Daiichi after detecting Xenon-133 and Xenon-135 in the primary containment of the plant. -The borated water injection lasted one hour, from 3 AM to 4 AM on Wednesday November 2, 2011. -According to information released to NHK Japan, TEPCO cannot rule out (and this is my rewording of their release) some measurable fission rate in the demolished core structure. -A look at the indication by TEPCO to NHK and a quick perusal of graphical data to the present shows no rise in PCV pressure or any of the measured temperatures at the plant. However, as I've noted many times, the state of derangement of the lower pressure vessel head... and the amount of fuel material exit from the pressure vessel... cannot be guaranteed or even accurately estimated. Thus, lower vessel head temperature may not be indicative of the temperature of the entire (demolished) core mass. 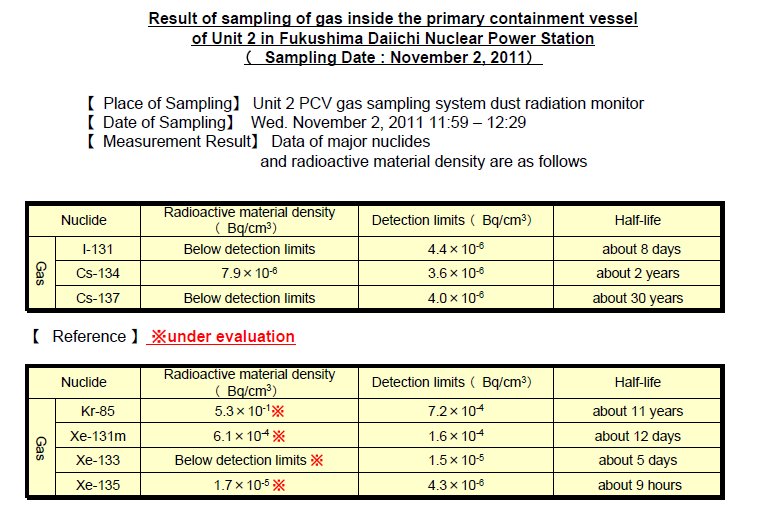 -TEPCO states that the Xenon concentration in the samples from the gas handling system is "low." Xenon is produced in a reactor as a product of fission; when the U-235 nucleus splits, the resulting pieces or "fission fragments" can be a number of different elements. Xe-135 is produced directly from fission in a very small amount (~.2 to .3% of fission products) but is produced indirectly in larger amount from Tellurium 135 since the Te-135 decays in less than two minutes to I-135 which then decays with a half life of 6.7 hours to Xe-135. This Xenon, unless it absorbs a neutron (which it has a very high propensity to do - it is an impressive neutron absorber or "poison") will then decay with a half life of 9.13 hrs to Cesium 135. It seems obvious then, considering the Xe-135 alone, that this finding indicates that there are fissions occurring. Fissions are indeed normal even in a shut down reactor, of course; they occur naturally. TEPCO has injected borated water because boron is a significant neutron absorber; it is thus a "poison" and will absorb neutrons before they can be absorbed by U-235 and cause fission. Clearly TEPCO has considered that an increase in fissions per unit time may have occurred, or perhaps even a recriticality in a limited volume of the core material.. having stated explicitly that it cannot be ruled out. Having said all this, the net probable effect on the total operational aspects of the plant itself, on safety, and on environmental release is probably ZERO. This is assuming a number of things; we will certainly be awaiting a press release or sitrep update from TEPCO in the later hours tonight. Update 1 - 9:45 PM Eastern - Both NHK and Kyodo News are now carrying news flashes on this story. EDIT: November 3rd... Boric acid injection took place from 2:48 AM to 3;47 AM on November 1st. Labels: "boron", "fukushima daiichi", "recriticality", "TEPCO"
NHK is carrying the news that Kyushu Electric Power Company has restarted Genkai No. 4 reactor, Kyushu, Japan. This is the first return to the grid for any nuclear reactor in Japan since the shutdowns following the Great East Japan earthquake and tsunami, and the shutdowns following the Fukushima Daiichi accident. Labels: "genkai", "japan", "kyushu", "restart"